New post over at The Bump! I’ve been going on about pregnancy so much lately that I’ve started to bore myself. So let’s change the subject, shall we? Instead of listening to me whinge about my poor aching back and squished organs, let’s all make fun of my pre-adolescent self. Did I ever tell you about The Movie? Why, I don’t believe I did. Back in the day, my sister, my two cousins and I decided to write a movie. At the time, I was ten, my cousins were eleven and twelve, and my sister was thirteen. The four of us used to play together all the time, but were at the start of a somewhat awkward era wherein I still wanted to play pretend games but my sister had moved on to more teenager-y things like an obsession with The Outsiders. Our cousins were of two minds. So as a compromise, we decided to write a movie. How was this a compromise you ask? Well, I’ll tell you: Because our particular style of “writing” was to act out the scenes (or, as some might say, “make pretend”) and then write down what we said. It was much more efficient that way, even if we sometimes forgot to do the writing down part. The next step was to come up with a plot, and it was a good one. The theme would be drunk driving. (We were against it.) The four main characters were named Carolyn (me), Vicki (my cousin), Kim (my cousin), and Kasey (my sister). The premise was that Carolyn, whose nickname is “Crayon”, Vicki and Kim are juniors in a high school and also members of a band called “The Dreamers” whose singer just quit. (Also, for what it’s worth, a band whose set list is suspiciously identical to the Go-Go’s Beauty and the Beat.) Kasey transfers to the school, makes friends, and – what a coincidence – is a singer! And with this cliffhanger – Will Kasey join the band? Will Kasey start dating Carolyn’s brother, played by C. Thomas Howell? Will we learn the origin of Carolyn’s SUPER COOL nickname? – I will leave the story for now. It’s been a long long day. But never fear, I will be back to answer all your burning questions. 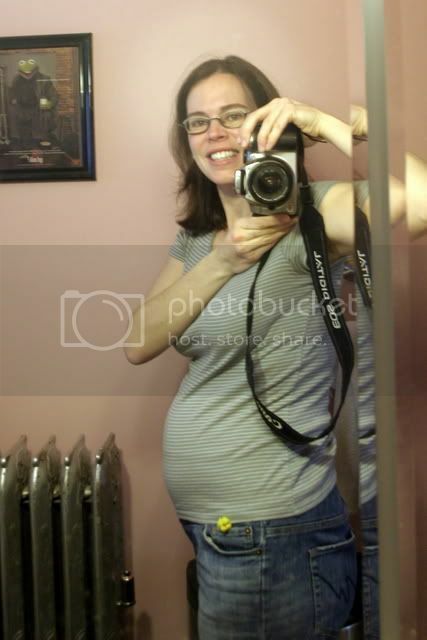 Oh, and last week I took a belly shot of me at 28 weeks. Mr. Pickles in the house! Last night, my friend called me at 5:00 and asked me if I wanted to go see the stage version of Dirty Dancing that very night at 7:30. She had scored two free tickets. And I went! This was unbelievably spontaneous of me. I had had big plans to watch The Amazing Race and pay bills, but I went ANYWAY. I am wild and crazy! Anyway, here is a story about my nephew. I forget what his nickname is. Elfin Nephew maybe? At any rate, he is five, and after finishing the God Blesses in his nightly prayers, he asked his mom, what a blessing is. "It's all the good things that God gives us like family and food and a warm bed to sleep in," she replied. He considered this for a moment, and then said, "Well, he didn't give me the right kind of bed. It's small and it has a big lump in it." Dude, quit kicking me in the kidney! As I believe I have mentioned, the ugliness of the third trimester has made an appearance. With three months to go, I am frightened because I am already so very uncomfortable. Last week, my mom – who is one of the fortunate few privileged to endure a litany of my complaints over the phone – commented that at least I seem to be a good mood despite my discomfort. “Ah, yes, but you don’t see me at night,” I told her. Once Jack goes to bed, you see, I sink into a horrible funk of misery and self-pity. It is a real treat for Andrew, believe me. Take, for example, the “round ligament pain.” Which I have. Constantly. Well, OK, only when I move. Fortunately, the round ligament pain has been easing a bit lately, as my beloved daughter has been making herself a bit more comfortable by stretching out sideways and kicking me repeatedly in the right kidney. So… yay? And then! In the wee hours of last Saturday morning, I awoke to the delightful sensation of incredible tightness in my stomach, almost as though a very small person was lying on it whilst elbowing me in the intestines. After throwing up my dinner for an hour or so I was able to go back to sleep, but I spent Saturday lying around morosely, feeling sorry for myself and trying to determine if and what I should eat. I didn’t know if I had contracted food poisoning or a stomach bug or what, all I could tell was that I was simultaneously hungry and semi-nauseous and if I ate, I felt better, but only for five minutes. By Saturday night, after noticing that I felt much better when I lay down, I had self-diagnosed myself with a case of “A fetus is squishing my digestive system.” Since then, I’ve had to eat tons of small meals all day long because my poor little squished stomach can’t handle normal sized portions. Although in the interest of full disclosure, I should admit that as of this writing, I think she’s shifted again and is giving my stomach and kidneys a break. Now she’s focusing on my lower back. And of course the round ligaments. In happier news, this weekend, we totally scored two Little Tikes play houses at a yard sale for a grand total of thirty dollars, including delivery. Yes, the guy delivered them for us because they wouldn’t fit in our car. I’ve been in the market for a used Little Tikes play house for some time; I didn’t want to buy a new one, because they’re outrageously expensive and also totally indestructible, so I knew a used one would be just fine. They hose right off. I’m not thrilled that one of them is very pink, but on the other hand, I’ve heard a rumor that a little girl is coming to live here pretty soon, so maybe pink is for the best. "Jack, don't put your head in your potty! 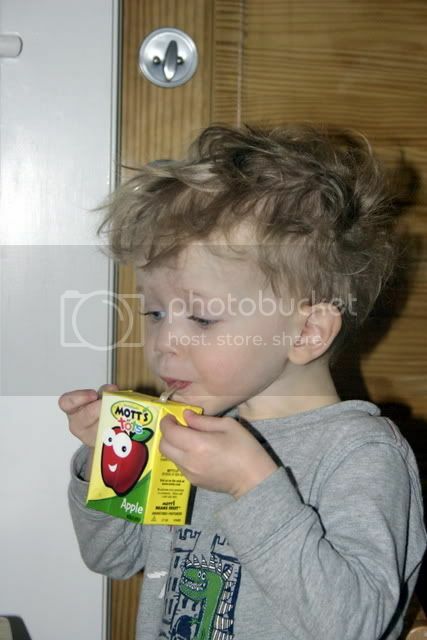 And, oh dear lord, don't put CEREAL in there and then eat it!" Hey, guess what! I’m now a featured blogger at TheBump.com, a division of The Knot, Inc. It’s a gathering place for moms, and I’ll be posting there about twice a month. So to see the rest of this entry, you’ll have to click over! Bleah. Blearrrgh. Bleah bleah bleah. After a month or two's respite from the awfulness, pregnancy discomfort has once again reared its ugly head over here. And while this late second trimester discomfort of heartburn, backaches, and the feeling that I need to carry my belly with my arms to keep it from falling clean off is preferable to the "discomfort" of the first trimester's constant nausea and incredible fatigue, I have to admit that there would be no discomfort at all if I had my way. Seriously, who is in charge of this pregnancy design? Because it is flawed. FLAWED. We have an incredibly comfortable recliner-style rocking chair in Jack's room. There is a lever to extend a footrest, but I could not get the chair to recline. I used to nurse him there, and before we switched to his twin bed, we read stories there. (Now we read them in his bed.) I've also spent many an hour sleeping there, and I can't tell you how I've longed for the back of the chair to recline, especially after an hour of trying to get comfortable in the middle of the night. There was once an episode of Night Court where Bull took a Polaroid, and when it ejected, he said, "Rats, another blank one," and tore it up and threw it away. "Bull," said Harry, "you have to wait for them to develop." Bull started at Harry, agape. "How long have you had that camera?" Harry asked. Bull replied, "Nine years, eight vacations, two weddings, and my niece's birth." I was reminded of that episode today when I discovered that the chair DOES recline. Those of you who are Swistle fans (which, thanks to the INTERNET PHENOMENON that is The Chicken Game, are now approximately two thirds of my readers) know that Swistle has been on a kick to buy fun stuff kick to save the environment and has converted to cloth napkins. Of all sorts, in fact, but here I am referring to the DINNER napkins. You will also know that she has sent out several care packages of said napkins to the lucky commenters chosen by the fickle Random Number Generator. Sadly, I was not among those lucky few. Swistle’s package totally made my day, which had been kind of terrible until that point, and it was only made nicer by the fact that the package was a complete and utter surprise in every way. Moral: Sometimes, it is an advantage to be a little on the slow side. I took a picture of the Swistle napkins and also of the napkins and napkin rings that I bought for myself. 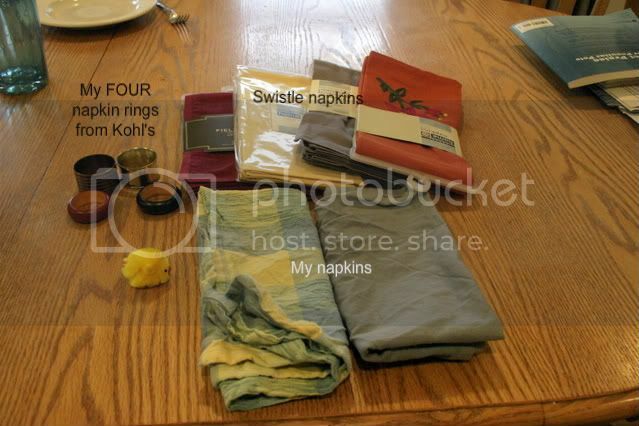 The FOUR napkin rings that were left at Kohl’s the day I was there, might I add. Only four. I never thought I would be the type of person who would be excited to find napkins that match the kitchen curtains, and yet, here I am. 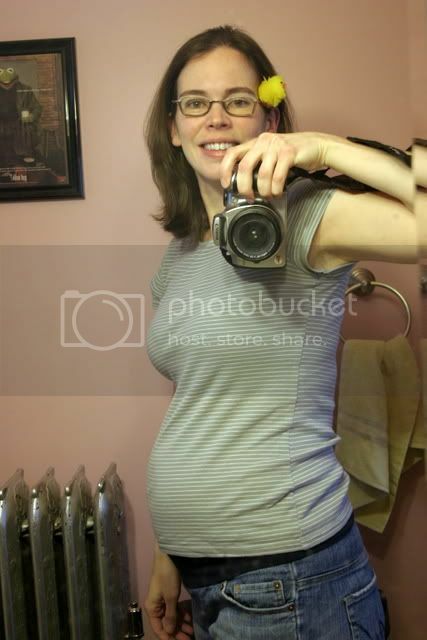 And here’s me, at 26 weeks. I am exploding. This weekend, we put a new rug pad under our living room rug, which involved lifting up the entertainment center. The entertainment center weighs approximately eleven billion pounds, but that didn't stop Andrew from trying to lift with his arms. Astoundingly, that didn't work, and Andrew started to say how we were going to have to empty it out, blah de blah blah. Now, "emptying out" the entertainment center is a huge ordeal of a project involving unplugging things, labeling cords, and finding a location for the nine thousand DVDs and videos we own but never watch. I suggested a lever. We only needed to lift the thing a few inches, after all, and Jack and I had recently learned all about levers on both Curious George and Sid the Science Kid. So I knew that if we had a stick and a cantilever, we'd be golden. I mean, on George, the real-life kids they show at the end of a cartoon moved giant rocks using a skateboard as a lever, and if THEY could do it, two people with advanced engineering degrees should be able to do it. We're definitely smarter than those kids. Right? So long story short, the lever worked and we did not have to empty the entertainment center. And when Jack saw what we were doing, I took advantage of the teachable moment and showed him how we had made a lever, just like George and Sid. That was yesterday. Just now, while I was drinking my coffee, I heard Jack call out, "Hey, Mom, I'm moving the chair!" Yes! We finally, FINALLY painted our bedroom. I realize I started talking about this weeks and weeks ago, but there was a delay. “A delay?” you are saying. “A delay in a home improvement project?” I know. I was stunned as well. This particular delay was caused by, of all things, the duvet cover. I ordered one from West Elm back at the beginning of January, but then I had to wait until it arrived before I could choose a paint color. Unfortunately, it was back ordered. Fortunately, it was back ordered for only two weeks! Unfortunately, after two weeks, West Elm emailed me to say they were so sorry, but the duvet cover was back ordered even further. Fortunately, only for two weeks! And so it went. I was reminded of the time Andrew and I were waiting in an airport for our flight, and every twenty minutes they announced that the plane was delayed for twenty more minutes. After the third or fourth twenty-minute delay announcement, I overheard the ticket agent comment to her friend that the plane that was supposed to have taken off from New Jersey with us inside had not actually left Boston yet. Needless to say, we did not leave twenty minutes later. But this time, I did not fall for it. After only the second delay of “two weeks,” I cancelled my order. I did not have time to wait for the cotton to be grown and harvested. 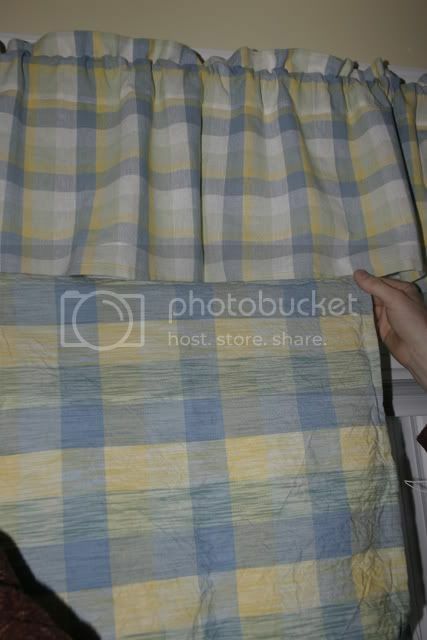 (Note: this duvet cover isn't even on their website anymore.) 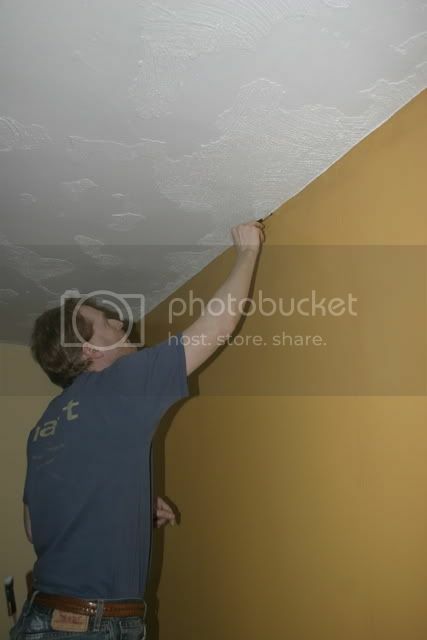 So I ordered another one, and after a few other boring scheduling delays, we were finally able to PAINT THE BEDROOM! Oh, hush. He only used that one to fix up the edges, and it only took ten minutes. 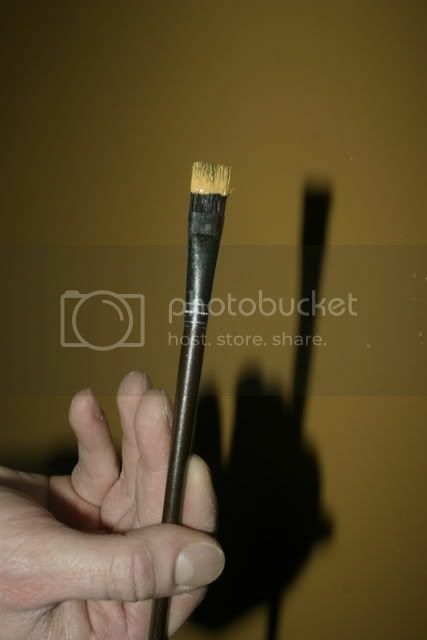 But no matter how much painting we do – and we do a lot – we are still very bad at estimating how long it will take. We primed on Friday, and it went so well, we were done for the day by 6:00. This made us think we’d be able to paint everything, put the room back together, AND go buy Jack a new mattress, all before 8:00! Yeah, not so much. Instead, we painted and painted and painted and Andrew finally made me stop at 9:30 with half the baseboard and one window still not finished. 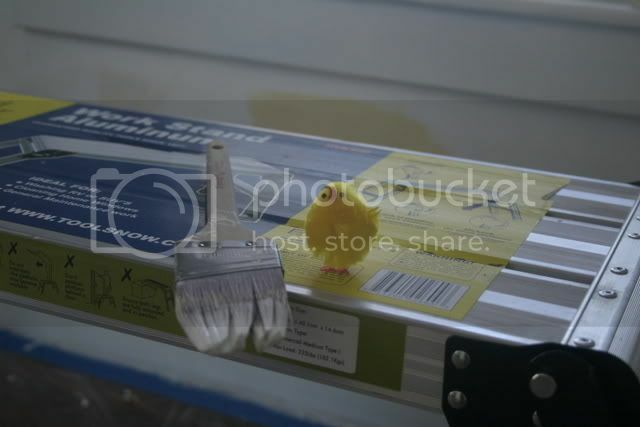 Thus, we spent Sunday painting some more and putting the room back together. 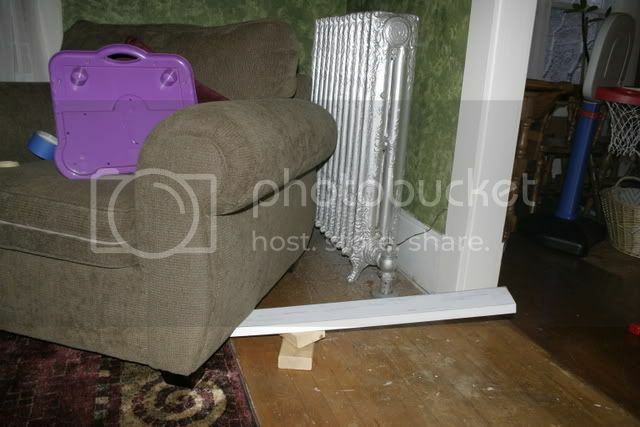 Naturally, there were delays – issues with the ceiling fan wiring. But we finally finished. So while the weekend itself was sort of awful what with all the hard physical labor and all, it was worth it. I don’t have any before pictures handy because we forgot to take them, but believe me when I tell you, the before pictures were awful. Awful awful awful. It was the bedroom version of our old kitchen: peeling, dingy wallpaper, crumbling ceiling plaster, and a grimy, disgusting ceiling fan.